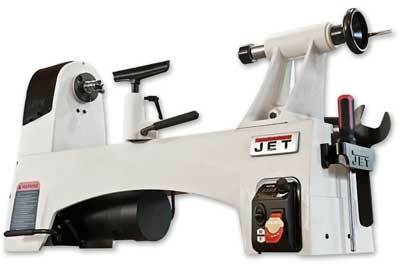 The JET 1221VS is a cast iron lathe that has been completely redesigned and is different from all the other JET models in the range. The bed is wider than normal for a small lathe, which increases the seating area for the toolrest banjo and the locking footprint. The heavy-duty sealed bearings are driven from a 0.73kW - 1HP - DC motor via a wide six-groove drive belt. All the motor controls - on/off, forward and reverse switch and spindle speed indicator - are mounted together in a neat display panel. The digital readout will record the spindle speed range as being 60-3,600rpm. The headstock allows a swing of 305mm over the bed and 510mm between centres and the tailstock quill has 64mm of travel. Both headstock and tailstock have 2MT Morse tapers and the headstock spindle is threaded to accept M33 x 3.5. The drive pulley is indexed to 24 points with a twist-lock system installed to lock everything in place while working. There are metal tool and cable storage racks on both ends of the lathe and a metal mesh tray between the legs. The benchtop version weighs in at a heavy 55kg and a bed extension and leg stands are available, which increases the weight and stability of this machine even further. I decided to turn two items: a goblet and a bowl. While setting the lathe up initially a noticeable feature was the belt and speed arrangements. While the drive is through a variable-speed controller there are also three pulley combinations to support the selection of the required speed ranges. The belt change is accessed via two doors: the top access lifts open and there is sufficient room to manipulate the top belt easily. The bottom access is via a hinged, magnetically held door and, in my experience, provides a unique belt tensioning ratchet mechanism. Once the ratchet is loosened off, the large accessible handle enables the motor to be lifted effortlessly and the belt to be relocated. A push down on the ratchet mechanism tensions the belt to its optimum setting. Both access covers have manual fastening rather than electrical micro switches, but this isn't a major disadvantage. The castings around the headstock, tailstock and bed felt well finished. I also made a point of testing how freely the toolrest moved along the lathe bed. In this case all seemed well and the banjo moved easily and locked down solidly when required. The bed extension was well fitted and in honesty, didn't feel like an add-on; the fit was exact and the tailstock ran over the joint easily and without any sticking point. The timber chosen for the bowl was elderberry (Sambucus nigra). The first step was to mount the 200 x 50mm blank on a screw chuck held in a set of jaws and, although the blank wasn't totally round, the initial speed was set at what the spindle speed indicator reported as 910rpm. The lathe was solid and had a robust feel to it. Although it can be used as a benchtop model, the demonstration model I had was fitted with a stand, extension bed and additional extension leg stand. All this cast iron made for a very substantial total weight and this was reflected in the feeling of solidity and stability. There was a choice of two toolrests - long and short - and I elected to use the longer version. The toolrest banjo, along with the tailstock, had a camlock mechanism and didn't move once after being locked in either of the turning sessions. Once the blank was mounted on the screw chuck, I set about turning the outside. The 12mm bowl gouge was deliberate as I intended taking some heavy cuts. The belt was initially set on the lowest pulley setting and the lathe didn't slow when the cuts were taken. 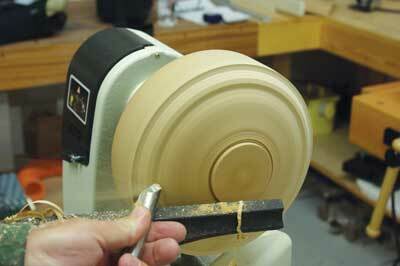 I then changed the belt onto the high pulley ratio and, with the speed still at 900rpm, started further cuts. I was pleasantly surprised to find that the lathe maintained its torque and the tool continued to cut well. Once the outside shape was roughed out, I increased the speed progressively up to 1,600rpm and finished off with a sheer cut. The bowl was taken off the screw chuck, then reversed and mounted into a set of 60mm gripper jaws. The inside was removed with the same 12mm bowl gouge and again finished at 1,600rpm. I suspect most turners would use this in preference to the designated spindle lock. Once a rough shape was turned, I increased the speed to the full 3,660rpm - with the tailstock in place for safety - and again found that the lathe remained stable and wasn't too noisy. With the belt on the high pulley range and the indicator showing 1,200rpm, I took some heavy cuts with a 25mm spindle roughing gouge to see if the lathe could be stopped; although it seemed to slow slightly under the pressure of the cut there was no significant speed reduction apparent. 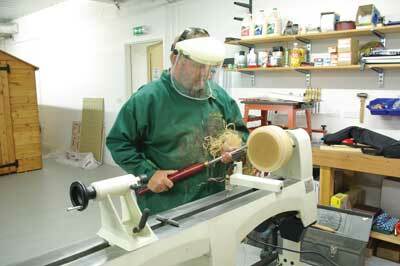 With the tailstock pulled back onto the extension bed end, I started hollowing the goblet. There was some vibration when a heavy cut was taken but nothing out of the ordinary. I used two different tools: a tungsten-tipped tool and a conventional spindle gouge. There wasn't a noticeable difference in vibration between the tools and the goblet was soon finished. I worked backwards down the stem and managed to find a knot, which resulted in a break-off - the good news being that this was down to the wood and myself rather than the lathe. As mentioned earlier, the spindle-locking mechanism's design is being reviewed. On reflection, the only features that I would change would be to add the ability to reposition the speed readout and associated controls to another location. Personally, I would overlay the metal mesh tooltray with either a wooden or plastic liner to prevent any vibration or the tools falling through the mesh. I would also change the belt access screws to knobs, which would make access quicker. I realise that these are all minor points and the location is one of personal preference. It should be noted that there is a H&S requirement to have the belt access doors either electronically switched or mechanically secured, although changing the screws to knobs may bypass the regulations. 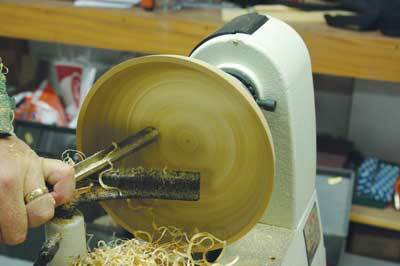 Overall the lathe performed very well, as I expected, having seen its weight and design. In my opinion, this lathe could be described as a midi rather than a mini lathe. Given its weight, size and quality, I think it will fit into the market well as a second-time purchase for those who want to move up a size from the true mini models, or equally, a first lathe for those who want to start a way up the ladder. I think it fills a gap between the smaller starter lathes and the current range of larger, more expensive models. Taking all this into account, I predict it becoming a firm favourite. I particularly like the quality of the bed extension and stand and would suggest many turners will consider buying these accessories at the outset. In summary, I think the 1221VS will punch above its weight.